When it comes to the issue of food preparation, you want to be sure that you're getting the right quality of utensils and instruments to ensure the health and safety of whatever you're making. 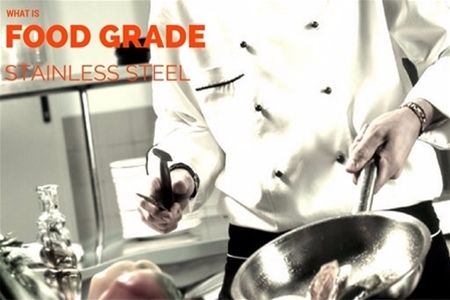 This will invariably lead you to the question of what is food grade stainless steel and why is it important to use. Food grade stainless steel is steel that is resistant to wear and tear and has heat resistance in such a way that it's safe for the use of cooking various types of food. There are a number of different grades of steel such as 18/10, 18/8, etc. What this grade means is the amount of chromium and nickel respectively in the steel. These, in fact, are the two most common grades of food grade stainless steel and are referred to as being in the 304 grade. For example, food grade stainless steel of 18/8 is 18 percent chromium and 8 percent nickel. 304 grade stainless steel also has to have no more than 0.8 percent carbon and at the very least 50 percent or iron. There are no other substances such as aluminium included in the creation of this grade of steel. 18/0 grade stainless steel has a negligible amount of the element nickel included and so has a reduced resistance to corrosion overall than the 304 and 300 series as a whole. 18/0 is part of the 400 series and is magnetic unlike the 300 series, which could make for easier storage. As far as the 200 series goes, this is still a food grade stainless steel, but is less resistant to corrosion overall, as manganese is used instead of nickel. These products are not as safe as the 304 grade or the 300 series as a whole. When it comes to stainless steel cutlery, the 18/10 and 18/8 actually don't have a difference in weight. What they do have a difference in is the overall sturdiness of the two. 18/10 cutlery will have forks with tines of a sturdier composition that the 18/8. When used with crockery, there won't be any damage or ill effects from the cutlery. Stainless steel is a very suitable replacement when it comes to Teflon-coated aluminium cookware. On the stove, stainless steel is not going to provide optimal heating, and this is why they're commonly used in a try-ply construction. For example, a frying pan will have a middle layer of aluminium with two layers of 18/10 grade stainless steel between so as to ensure the even distribution of heat throughout the pan or cooking surface. Most food contact equipment, pipework, containers and sinks are made from type 304 or 316 grades of stainless steel. The chromium of 17 percent stainless steel is 430 grade and is commonly used for housings, baffle filters, equipment enclosures, and splashbacks, where requirements for corrosion resistance aren't quite so demanding. The 306 grades of food processing equipment are considered to be the only types of food-grade steel, but this isn't the case. As we've seen, there are other types that are common, but they just aren't as resistant to corrosion and overall damage as much as the 300 grade stainless steels are. It's rather surprising, actually, that there are as of yet no regulations when it comes to the preparation of food using food grade steel in the UK. However, the European Framework Regulation has provided certain rules and guidelines when it comes to the use of food-grade stainless steel products to produce food. This regulation also makes sure that the nature, quality, and composition of the food is not in any way affected by the food-grade stainless steel pan or other cooking implement. If the specific grade of stainless steel is known and used accordingly, then there should be no type of corrosion to the surface. Smooth surfaces, for example, promote the cleansibility of the product, and they also reduce the specific risk of any corrosion on the product as well. Let's take a look at some of the types of corrosion possible. Acidic conditions (as well as increases in the temperature used) will increase the chances of crevice corrosion and pitting. Pitting corrosion is seen in local deep pits on the surface. Crevice corrosion, on the other hand, takes place in narrow crevices where growths on the steel might be taking place. This is a localized form of corrosion that's seen in the appearance of cracks in objects that are susceptible to a corrosive environment as well as heat. This is a type of corrosion that used to be known as weld decay. This is usually because of a localised attack that's typically in a narrow band that's near a weld. In order to avoid these types of corrosion, it's essential to keep your stainless steel equipment. Effective cleaning is absolutely essential to maintaining the quality of your stainless steel equipment. Should you keep your food-grade stainless steel products in working order, there's no doubt that you should have this equipment available for years and years to come. While this guide isn't exhaustive, it should get you started on the way toward ensuring proper functioning of your food implements.